Bead stringing is usually done for strands of pearls or other fine beads. Each individual bead is knotted into place along the thread. 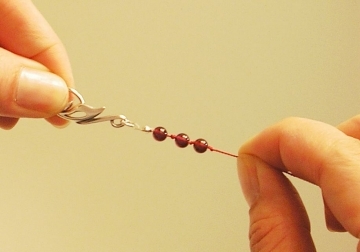 This looks nice and prevents beads from falling off if the thread should break. TIP - For design ideas, use a thread color that either matches or contrasts with your beads. This will be especially interesting if your beads are clear as you will be able to see the colored thread through the bead. 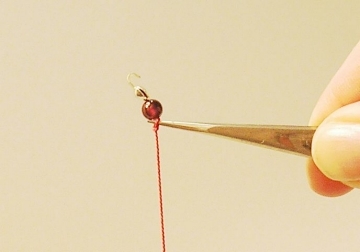 Learn the basics of bead stringing below, just follow my step-by-step instructions. 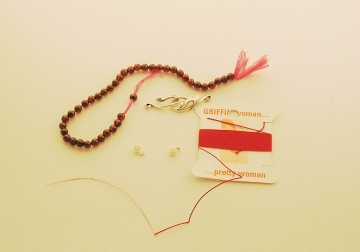 Select your thread, beads, and clasp. Select a thread that will pass through the diameter of your bead holes. 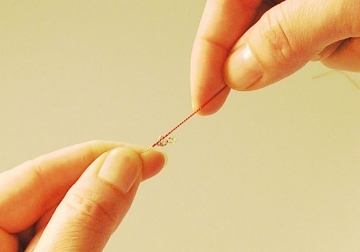 I usually buy colored silk thread on cards that already come with a beading needle attached. But, use whatever strong beading thread you like, and if it doesn't come with a needle, use thread conditioner like beeswax to make it easy to work with and pass through your bead holes. You have the option of attaching clamshell tips either before or after stringing all your other beads. If you plan to attach the tips before (like I will do in this example), make sure you lay your design out on a bead board or with a ruler first to make sure you will have the right number of beads for the desired length. Check the length throughout (the knots will add some length) to make sure you are on track before attaching the final clamshell bead tip and clasp. String the bead thread through the clamshell tip. 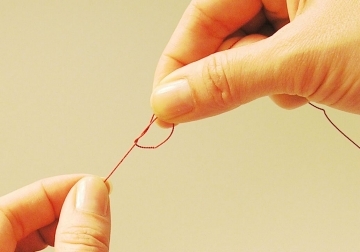 Make a surgeon's knot in the end of the thread. A surgeon's knot starts with a regular overhand knot, but pass it through the loop twice, then for the second part of the knot, make a regular overhand knot and pull it tight. 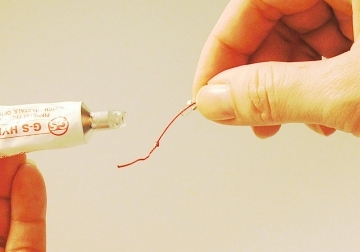 Place a drop of glue on the knot for added security, and pull the thread so the clamshell tip is held into place. The knot will hold the thread and attach it to the clamshell tip. 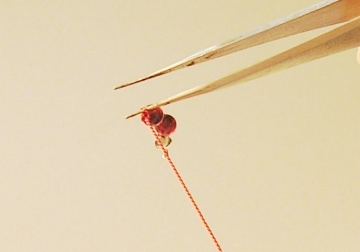 TIP: If your bead thread is too fine and a single knot is too small and will slip through the hole in the bottom of the clamshell bead tip, then first knot your thread around a tiny bead (like a seed bead) that is small enough to be covered by the clamshell once it has been closed. 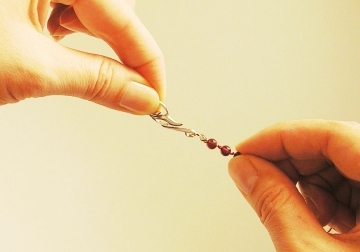 Use your flat nose (chain nose) pliers to squeeze the sides of the clamshell beadtip closed around your knot. 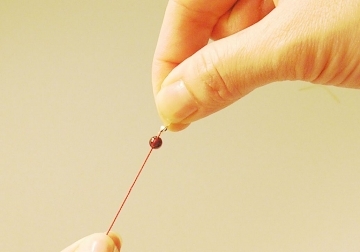 String your first bead. Slide first bead onto thread, up to the bead tip. Note: If you are planning to attach bead tips last, then leave several inches of thread at the end so you will have something to work with when you are ready to attach the tips. 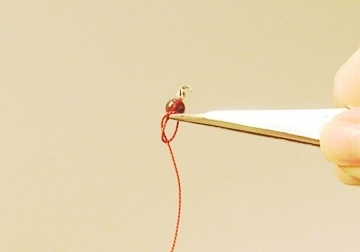 Make a regular overhand knot in your thread, as close to the bead as possible. Make sure the loop is loose enough that you can fit your tweezer points or an awl into the knot opening. 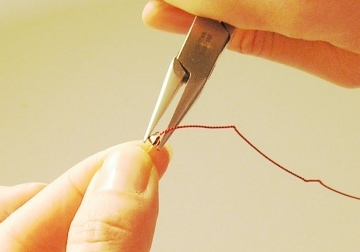 Continue holding tweezers up to the bead, pull gently on the thread while sliding the knot as close as possible to the bead, removing the tweezers only at the last moment as you draw the knot tight. 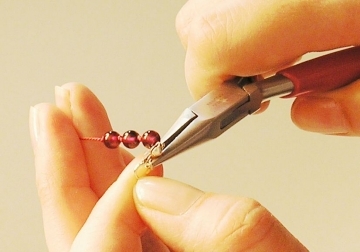 Add the next bead, and repeat the same process to make a knot up close against the bead. Repeat until you have strung and knotted all your beads into place. Check your length using a ruler or bead board to make sure before you attach the clamshell tip on the other end! Attach clasps through the loops on the end of clamshell bead tips. You can also use a jump ring if you prefer. 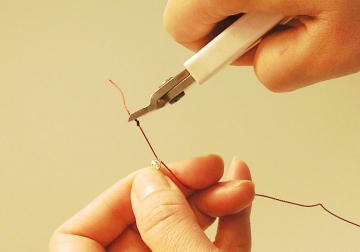 Use your flat nose pliers to gently squeeze the loop closed, so that it is attached to your clasp or to your jump ring. 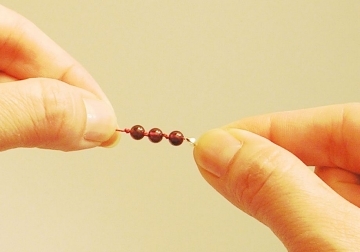 Need More Help Stringing Beads? Also, here is another set of How To Knot Instructions from ArtBeads.com. Hot off the presses! - Start Your Own Home Jewelry Party Business Today! Join our Newsletter for more free jewelry design projects and tips each month!